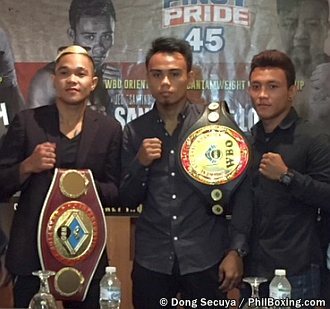 CEBU – Two Mexican warriors and one Ghanian national champion will arrive Monday, Nov. 19, ahead of their respective assignments for next Saturday's Pinoy Pride 45 triple WBO regional championships to be held at the IEC Convention Center here, ALA Promotions has announced. Victor Uriel Lopez (13-6-1, 6KOs) of Mexico City who will face heavy fisted Jeo Santisima for the WBO Oriental super bantamweight title, and Victor Hugo Reyes (9-1-1, 7KOs) of Tijuana who will take on unbeaten KJ Cataraja for the vacant WBO Youth super flyweight title, are coming in with their respective managers Antonio Lozada and David Padilla on PAL flight PR 435 from Japan that is expected to land at Mactan International Airport at 2:00 p.m. on Monday. George Krampah (14-3-0, 12KOs) of Accra, Ghana who will attempt to take away Prince Albert Pagara's WBO Inter-Continental super bantamweight belt, will arrive earlier at 5:15 a.m. via PAL flight PR 2835 from Manila accompanied by his trainer Frank Asante. The trio will meet with local scribes the following day, Tuesday 2:00 p.m. at St. Mark's Hotel. On Thursday, Lopez, Reyes and Krampah will meet face to face with their hometown foes in Santisima, Cataraja and Pagara at the Summit Circle Hotel along Fuente Osmeña Circle for the event's final press conference. Also seeing action on the loaded card are matches between comebacking world title challenger Jonas Sultan who will take on wily veteran Ardin Diale; two-time world title challenger Arthur Villanueva faces Carlo Demecillo; Lorenz Ladrada vs Ramel Antaran; Go Hosaka vs Jason Tinampay; and debutants Regie Suganob vs Mark Torela. The official weighin is set on Friday at SM City Cebu beginning at 11:00 a.m.